164 pages | 43 B/W Illus. Which kind of decisions are passed by Cabinet in coalition governments? What motivates ministerial action? How much leeway do coalition parties give their governmental representatives? This book focuses on a comparative study of ministerial behaviour in Germany, Belgium, Italy and the Netherlands. It discredits the assumption that ministers are ‘policy dictators’ in their spheres of competence, and demonstrates that ministers are consistently and extensively constrained when deciding on policies. The first book in a new series at the forefront of research on social and political elites, this is an invaluable insight into the capacity and power of coalition government across Europe. 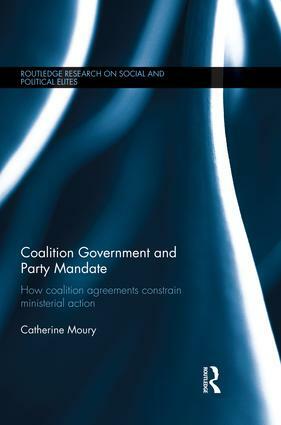 Looking at policy formation through coalition agreements and the effectiveness of such agreements, Coalition Government and Party Mandate will be of interest to students and scholars of comparative politics, governance and European politics. Catherine Moury is Assistant Professor at NOVA University, Lisbon, and researcher at CIES-IUL. Her research focuses on institutional change in the European Union and on coalition governments.